The art of printing directly on canvas is a realization that has revolutionized the reproduction of works of art. A happy combination of color and impact achieved by using new materials and techniques and old artisan printing methods. From the creation to the printing, to the final touches, all our production processes are exclusive and carried out according to the best artisan traditions. 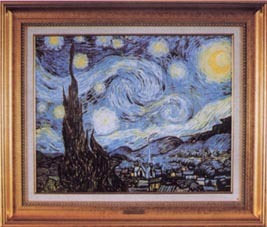 The special surface of the canvas has a repeating grain that reproduces the same consistency of the original paintings. The subtleties and tones of color of the originals can be restored, and a new three dimensional aspect can be added to the texture of the surface. This remarkable attribute enables the art printer to accurately reproduce all the various shadings of light found on the canvases of the great Masters with the use of special technical devices, ensuring the color vibration which is very difficult to obtain with other types of reproductions. These techniques ensure that the colors do not fade and allow these superb art replicas to endure forever: a true investment in "beauty". First, the print is coated, via spray or brush with a special acrylic that seizes the ink. After drying the resulting ink film is embedded into high quality artist's canvas. Rigid standards and meticulous attention to detail maximize ink retention, paper removal, and bonding. At this point, the picture has an image true to the original painting with a lustrous oil sheen and rich canvas texture. This is known as a basic transfer. This is a special pictorial technique that faithfully reproduces the brush strokes of the artist. It is carried out by expert artisans who superimpose the reproduction onto the print emphasising the depth, the tones and the shadings of the colors. A particularly interesting option is represented by the process of "ageing". This process has been achieved and perfected by our artisans after a lot of research and many experimentations. 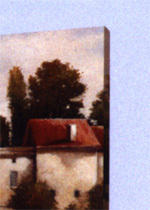 This technique was developed to give the canvas the coating and the body of the old paintings emphasising the "defects" that occur with the passing of time and with the exposure to different atmospheric conditions (heat, light, etc). This option is available, as an alternative to the retouching. Museum wrap is the process where the canvas instead of being stapled on the sides, which is normally how they are produced, our team will leave additional canvas material on the sides. This is done because when they get to the "Stretching" stage of the canvas, they use the additional canvas to pull and staple to the back. This makes the piece more presentable for those that do not wish to have a frame. Gallery Wrap is virtually identical to the process of Museum Wrap except for one detail. Instead of leaving extra canvas to pull to the back, our team will pull the image around the sides leaving what some deem a more "Contemporary" look. This is quite commen for those who do not want a white border on the sides of the piece. If I buy a canvas transfer and I don't like it, can I return it? 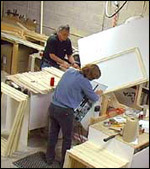 Each canvas transfer is custom fabricated to each customer�s specifications and is therefore non-refundable. If you are uncertain if the image you are interested in is going to work, you may order the print which is returnable and make sure that you are satisfied with the piece. After that, we will send the piece to our canvas transfer team to be completed for you.